Will a certain spiky-headed blue anthropomorphic hedgehog be joining everybody's favorite mustachioed plumber on his next adventure through space? UK Magazine NGamer might have uncovered a 1990s Nintendo fanboy nightmare: Sonic the Hedgehog could soon be a playable character in a Mario game. Super Mario Galaxy 2 to be exact, as NGamer revealed through its twitter account, of all places. The tweet reads: "We've just had some shocking news from an inside source at Nintendo: Sonic will be a playable character in Mario Galaxy 2! Wha?" I'm going to chalk this one up as an EXTREME rumor (note the bold caps), because it's such an outlandish claim. 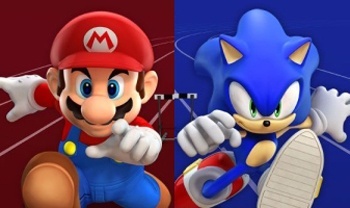 I know Mario and Sonic have already teamed up to take on the Olympics (and the Winter Olympics), but would Nintendo really allow Sonic to encroach into one of its core franchises? Or, is the company banking on the popularity of Sonic to draw more gamers to purchase Super Mario Galaxy 2? Even though Super Mario Galaxy sold millions of copies, it didn't sell as well as Super Mario Bros. Wii, so maybe Nintendo wants to use the iconic popularity of two characters to sell the Super Mario Galaxy sequel. NGamer's tweets didn't end there. The magazine emphasized that this information comes from a "trusted source," and even that "Sonic['s] levels will be in the 'Green Hill Galaxy.'" While completely possible, I can't help but feel that this sounds like a joke made out to goad people like me into making it news. Stories like this are why they invented the word rumor. Sonic's 3D adventures haven't exactly gone very well for him, so if this is true, I hope Nintendo can show Sega how to create a platforming hedgehog that really works. I'll only believe this when I see it, and play it.